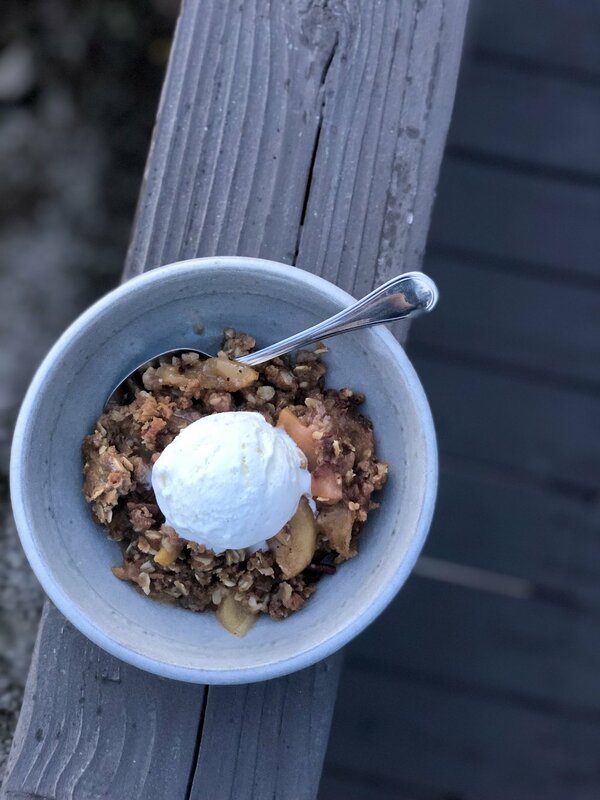 Apple crisp (or crumble, whatever you want to call it) is one of those good ‘ol classic desserts that always hits the spot. 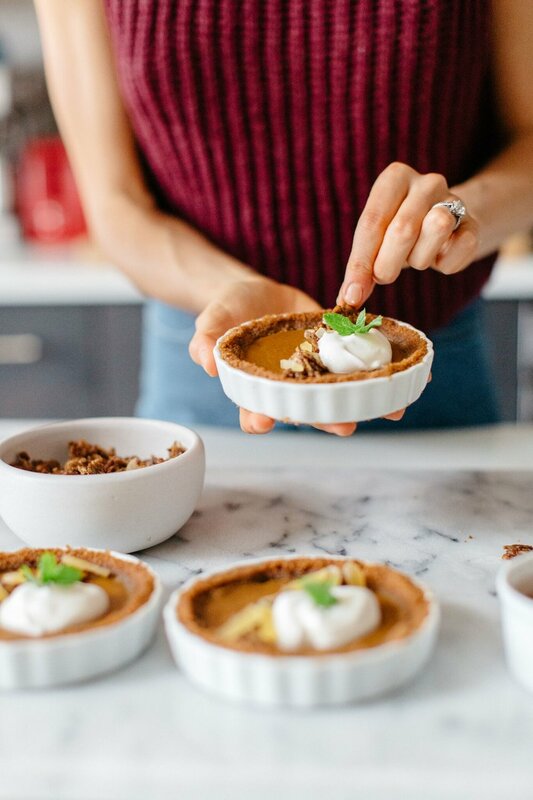 I love it come fall and winter, served warm with spicy notes of cinnamon and streusel topping. It’s super tasty alone, but even better topped with some vanilla bean gelato! Some apples, like Honeycrisp, Pink Lady & Fuji, are better for eating thanks to their crisp, sweet bite. Others, like Macintosh & Braeburn, are better for cooking, and get nicely stewed in a crisp. I like using a variety of apples for layers of flavor and texture that can’t be beat! 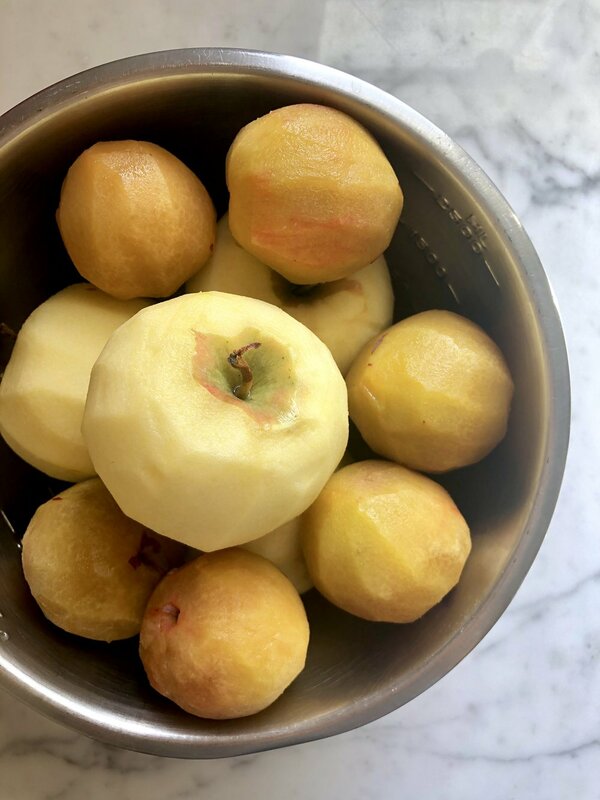 This time I also decided to throw in some gorgeous, seasonal plums that I had on hand. Perfect combo! Don’t forget about crisps and crumbles during spring and summer- by switching up the fruit, you can enjoy a delicious bowl of goodness year-round! Preheat oven to 350 F, and butter a large baking dish (9x13 or 2 qt oval). Peel, core & cut apples into 1/4-inch slices, and place into a large bowl. Add lemon zest, lemon juice, sugar, cinnamon, nutmeg, and cornstarch, and mix to combine. Pour apples into baking dish. 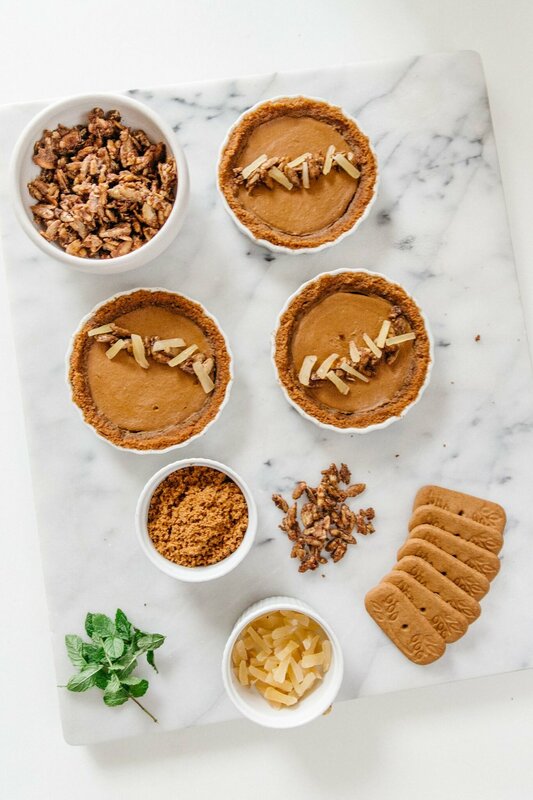 For the topping, add the flour, oats, pecans, cinnamon, salt, and sugars in a large bowl and stir well with a wooden spoon. Work the butter into the mixture with your fingertips until evenly distributed (you may also use a stand mixer if you prefer). Spread the streusel topping mixture evenly over the apples. 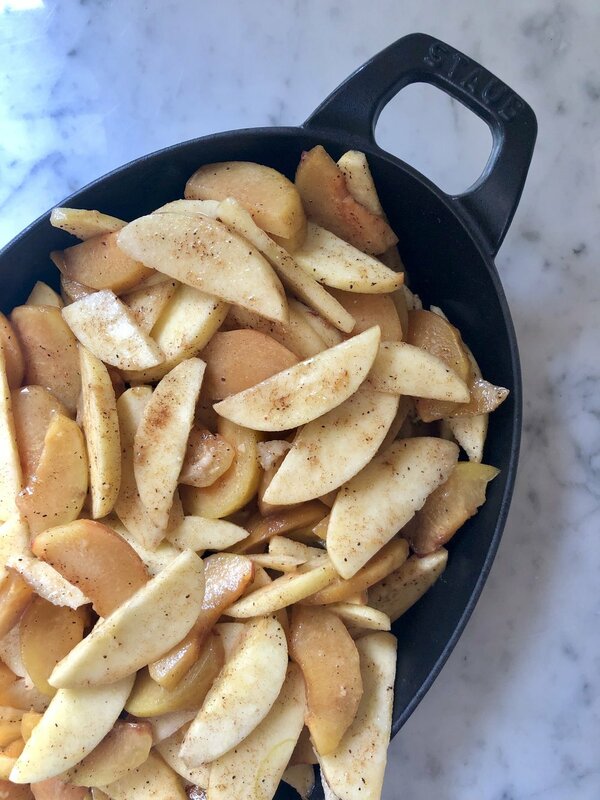 Bake the crisp in the dish on a baking sheet on the center oven rack until the topping is crunchy and the apples are bubbling, about 55-60 minutes. Best served warm, topped with vanilla bean ice cream. *Adapted from Sit & Stay Awhile Apple Crisp by Joy the Baker and Old-Fashioned Apple Crisp by Ina Garten. Preheat oven to 350°F. Spray two 9" round cake pans with nonstick spray, line with parchment paper, and spray the parchment as well. Mix together flour, baking powder, baking soda, and salt in a medium bowl. In the base of a stand mixer fit with whisk attachment, beat butter and sugar at medium speed until pale and fluffy, then beat in vanilla. Add eggs, beating well and scraping down the bowl to ensure they are fully incorporated. Reduce the speed to low, then mix in buttermilk until just combined. Don't be alarmed if the mixture looks curdled at this point. Add flour mixture until just incorporated, careful not to over-mix. Pour batter evenly among cake pans, and bake until golden, about 35-40 minutes. Allow to cool for a few minutes in the pan, then completely on a cooling rack. To prepare raspberry compote, cook raspberries, sugar, cornstarch, water, and lemon juice in a small saucepan until the berries start to break down, about 10 minutes. Lower the heat and simmer until the compote is thick, about 5 minutes. Remove from heat and let cool completely. Store in an airtight container in the fridge (this can be made a week ahead of time). Makes 1 cup. 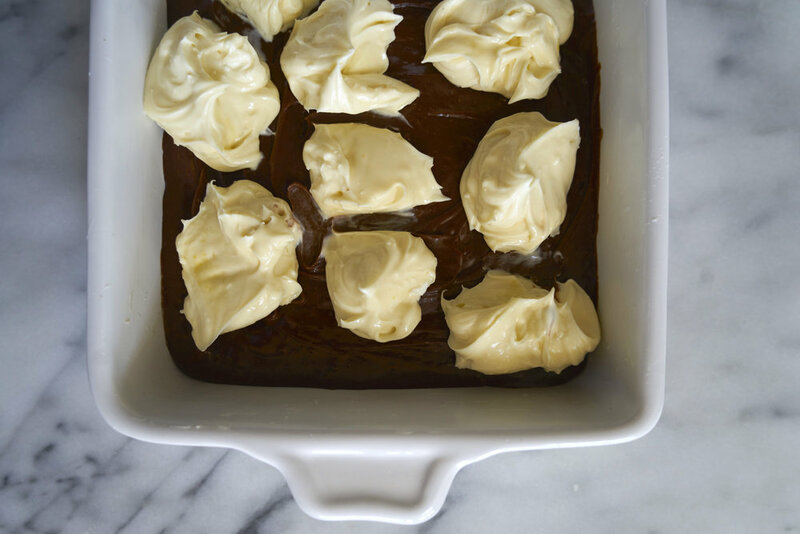 While cakes are baking, make the buttercream. Whisk egg whites and sugar together in a bowl over a double boiler until sugar is fully dissolved. Transfer mixture into the stand mixer (make sure it's clean & dry!) fit with paddle attachment and whip until it turns white glossy. Add the vanilla, then the butter and continue to whip until buttercream comes together. This may take a good 10-15 minutes, so don't worry if things look curdled or soupy at the start! Once cakes have cooled, you may level and assemble them, adding filling between the two layers. Spread buttercream evenly around the outside, creating a pattern if desired, and finish with toppings if you choose! You may also make this a 3-layer cake by baking in 6" round cake pans, just make sure you adjust baking time accordingly. 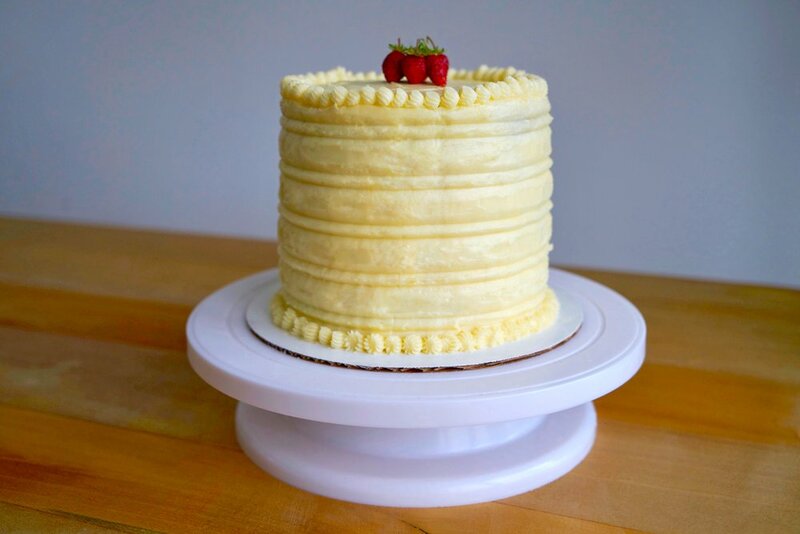 Check out my wedding cake post for more assembly and cake decorating instructions. Enjoy! *Adapted from Best Birthday Cake and Swiss Meringue Buttercream by Smitten Kitchen. My husband has been on a serious açaí bowl kick lately, and to be honest, I'm not complaining! They're refreshing, delicious, and packed full of healthy ingredients like açaí (duh! ), nuts, seeds, and other fruit! The options are pretty endless, but a good place to start is with some high quality, unsweetened açaí, either puréed and frozen or freeze-dried and powdered. The recipe for our go-to version is listed below, but feel free to play around with your favorite superfoods! We love including chia seeds, matcha powder, coconut flakes, and almond butter for a healthy, yet satisfying treat. While artfully arranging the toppings over your smoothie is not necessary, it sure does make for a pretty darn beautiful breakfast or snack! 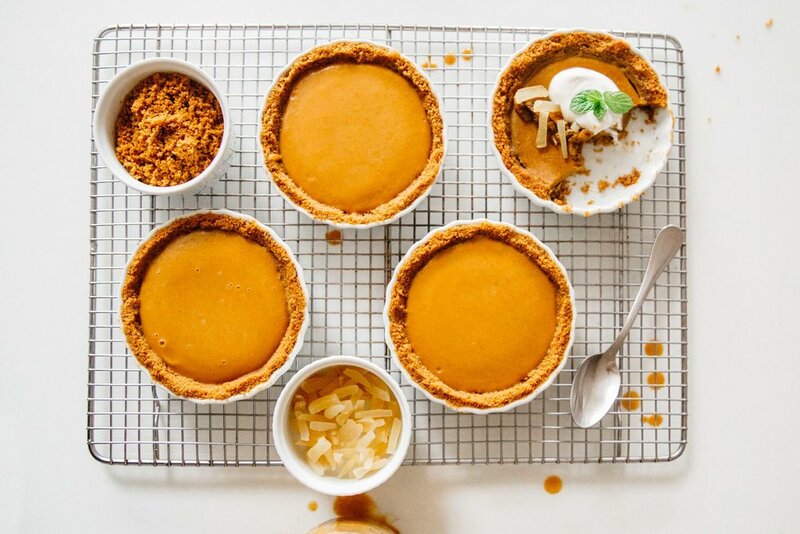 PS- Make sure you go follow my husband's catering company, Beck & Call, as well as his soon-to-be casual eatery Scratch BK, for more delicious eats! toppings: fresh raspberries, strawberries, blackberries, bananas, coconut flakes, granola, almond butter, matcha powder, chia seeds, hemp hearts, flax seeds, etc. Blend everything together in a high-powered blender, like a Vitamix. You're going for a thick smoothie consistency, so that it can be eaten with a spoon. Scatter desired toppings across the bowl. Enjoy! Makes two bowls. 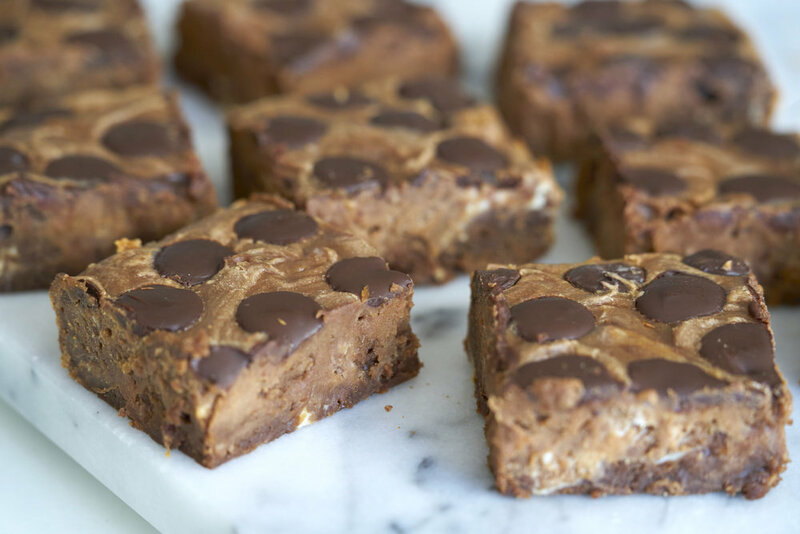 Not many things go together better than peanut butter, bananas, and chocolate. These muffins are the perfect combination of all three, and I love how easy they are to whip up. Because of the (mostly) healthy ingredients, they make for a tasty breakfast, sliced and served with an extra smear of peanut butter and sliced bananas. Or if you'd rather make them a bit more naughty, throw in some extra chocolate and peanut butter chips for good measure ;) I chose to bake these in a pretty rose-shaped muffin tin, but a regular muffin pan will work just fine. Whichever route you take, these muffins are sure to hit the spot. I hope you enjoy! Preheat oven to 350 degrees. 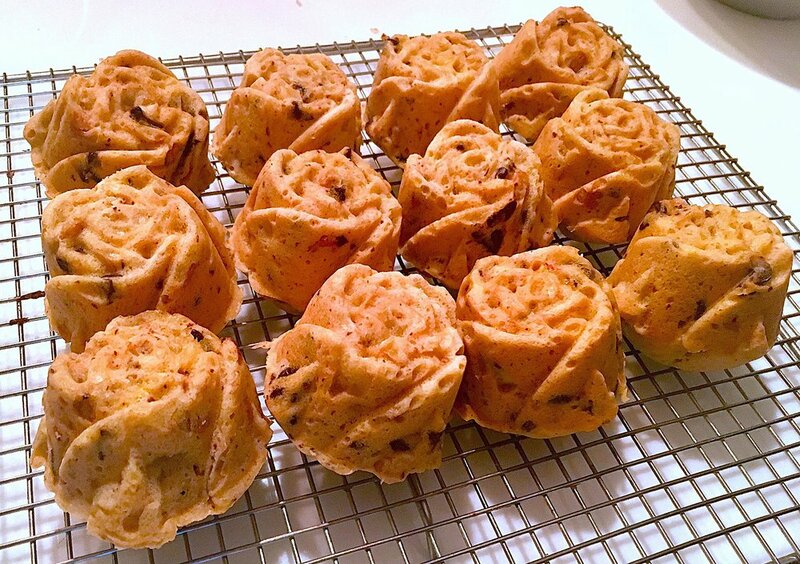 Spray a standard 12-cup muffin tin (or rose-shaped one!) with nonstick spray, and line with cupcake liners if desired. 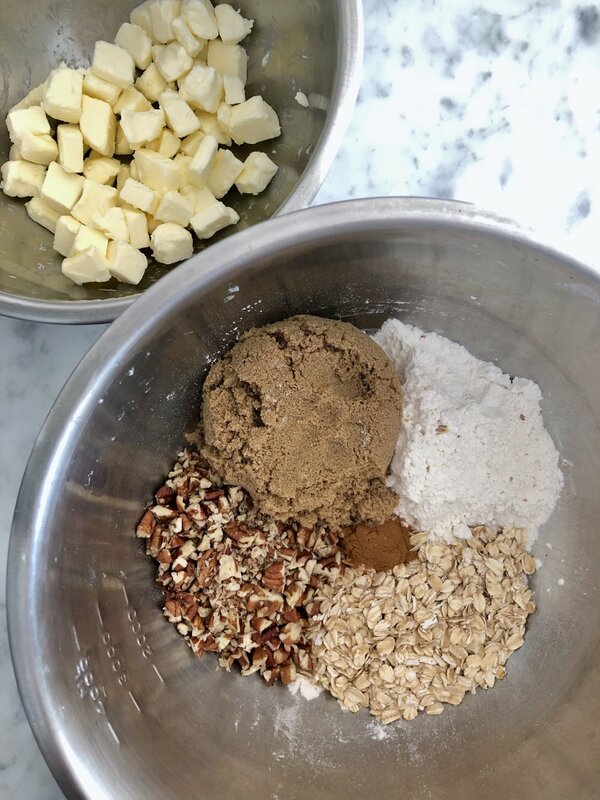 In a medium bowl, sift together both flours, oats, baking powder, baking soda, and salt. In a separate bowl, stir together bananas, brown sugar, honey, egg, peanut butter, greek yogurt, and vanilla extract. Mix wet ingredients into dry ingredients until just combined. Then fold in chocolate and peanut butter chips, if desired. Divide batter evenly between prepared cups, adding about 1/4 cup to each. Bake until a cake tester comes out clean, about 20-24 minutes. Cool in pans 5 minutes, then move muffins to wire rack to cool completely. Enjoy! *For a vegan version, sub coconut yogurt or applesauce for greek yogurt, and flax "egg" for egg.